Are you experiencing disruption in your industry? If not, prepare yourself because it is coming. On-demand workers (you may call them freelancers, contractors, or gig workers) are increasing in numbers with no signs of slowing down. The reason this business model is so popular is simple: on-demand workers provide cost savings and can lead to higher quality and faster work outcomes. As a supplement to your full-time employees and with the advent of automated technology solutions, there has never been a better time to take the plunge with a blended and agile workforce, especially if you’re an operations manager that needs to complete projects on-site. Field service technicians in the IT space are hired to install, repair, and maintain hardware. The equipment is often decentralized and service needs are usually unpredictable due to unexpected breakages and other factors such as weather. Fast response times are demanded by customers for whom connectivity is critical. It’s often difficult to find these highly-skilled technical specialists. Spend Matters reports that tech and field service organizations are using curated on-demand workforces to save costs (by $5 million), reduce response times by 40%, and improve customer satisfaction by 20%. Whether you have several or thousands of retail locations, chances are they are dispersed geographically and that you experience cyclical sales. Whether seasonal or due to fluctuating market demands, it can be challenging to balance the service level needs across your organization. Plus, think about all those times one of your stores has experienced a broken register or needed an installation. Would you really send one of your full-time employees to complete such a task? An on-demand workforce helps fill service level gaps and automation helps you quickly identify and implement the optimal coverage ratios. 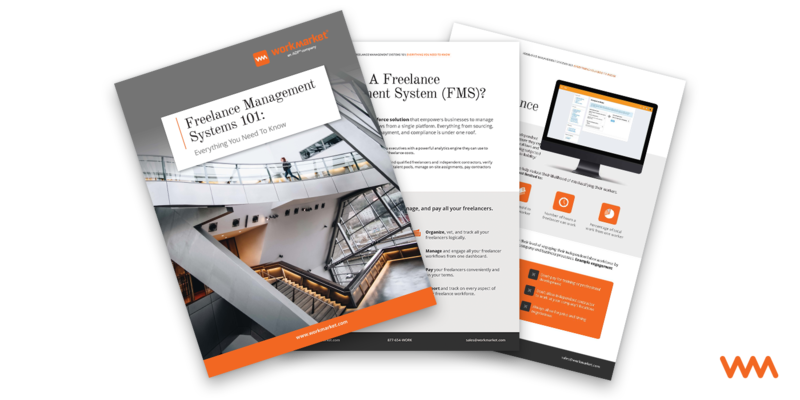 Click here to access how a Freelance Management System can help your business. Addressing health care costs is a top priority and one method that can significantly impact labor costs is the use of an on-demand workforce. Hospitals can negotiate directly with providers, avoiding costly fees to intermediaries. It also gives all health care facilities access to specialists as needed, even if occasional and short-term. But it’s not just the highly-specialized health care freelancers that are primed to find more work and assignments. The demand for at-home care continues to grow. This also includes helpers with everyday tasks such as washing dishes or cleaning for those that need physical help with daily chores. Health care providers will take notice of this trend and begin to adapt to a more flexible workforce - one that can deliver as a service to increase their reach and better serve customers. Independent health care workers can benefit from greater flexibility and control of their careers. Offering multiple employment opportunities helps to address labor shortages and allows workers to choose what is best for them. After all, the delivery of high-quality health care quickly is nothing but a good thing, isn’t it? But it’s not just media companies that are leveraging freelancers. Marketing and creative agencies constantly need to develop content to drive sales. No more losing out because there wasn’t a reliable resource available at the right time and place. In a highly competitive sector where content is “king,” on-demand workers can make the difference between an organization dying or thriving. A hybrid workforce blended of both full-time employees and contractors helps to keep labor costs down. But it can also make waves in retaining skills knowledge to prevent the corporate brain drain. In a sector that requires highly specialized skill sets on a cyclical basis, an on-demand workforce is a perfect fit. And given the cyclic nature of insurance (think natural disasters like hurricanes just to name one), it is easy to understand how on-demand workers can help supplement full-time employees when there are work load imbalances. Add the challenge of finding highly skilled and seasoned professionals and you have a recipe that makes this industry well positioned to take advantage of the on-demand economy. The education industry has a long history of on-demand workers in the form of substitute teachers. However, what is new is the use of freelancers in other capacities and the technology to support new educational models. For example, online teaching and tutoring has become extremely prevalent. Like other independent workers in the new on-demand economy, many educators appreciate the personal and professional freedom that comes with independent work. So do teachers, students, parents, and graduates. When it comes to property management, today’s consumers demand immediate response times. They want to use technology to pay their rent and to submit service requests. Sometimes, the service requests are of an urgent nature and demand immediate attention. An on-demand workforce can often be the best choice for getting the right person at the right job at the right time. And when repairs are done quickly, they add value to the living experience, helping to decrease vacancy rates and increase retention. It’s all about bridging that perceptive gap between tenants and supers. Clearly the world of on-site work is changing. Businesses are preparing themselves with on-demand workers. Now, they just need a technology to organize and manage that talent.